More reviews from the G.A.S. page. Old Black y and case. Detailed photo of the body. 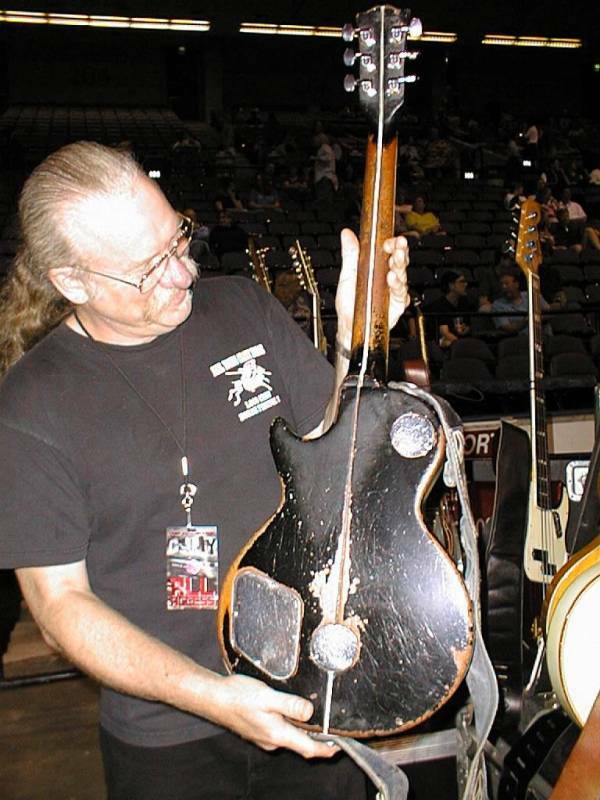 Larry Cragg, Neil's guitar technician for many years, shows the OB's back . 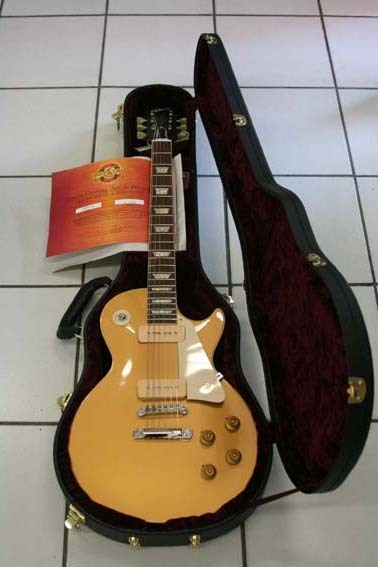 This replica is based upon a Gibson Les Paul Historic Reissue '56 Gold Top (R-6) bought new on purpose for this project. All the "relicing" and "cloning" has been hand made to make it what is probably the best possible and commercially available replica. 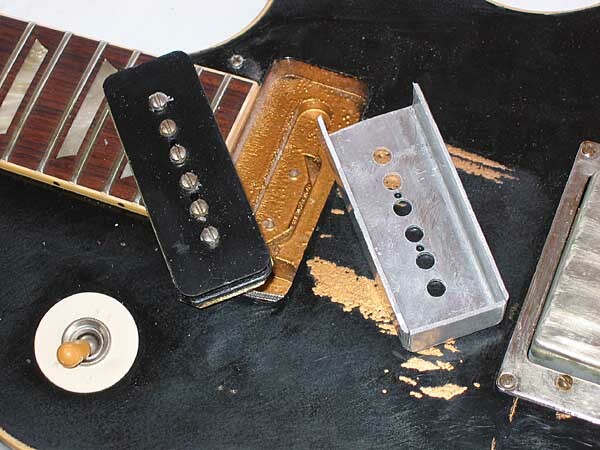 Pay attention to the next photo and how "badly" is the scratchplate routed over the bridge pickup and around the neck pickup. It's really made on purpose. Look above the first photo of the original and you'll see how much accurate this job is. You'll see other more detailed photos below. 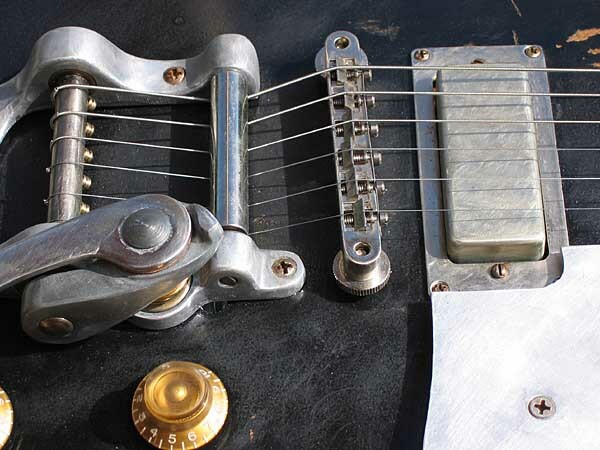 bridge pickup ring and P90's cover are all hand made with aged aluminum. The switch ring is also worn out, as it is in the original. The aged switch button is browner than the usual amber. 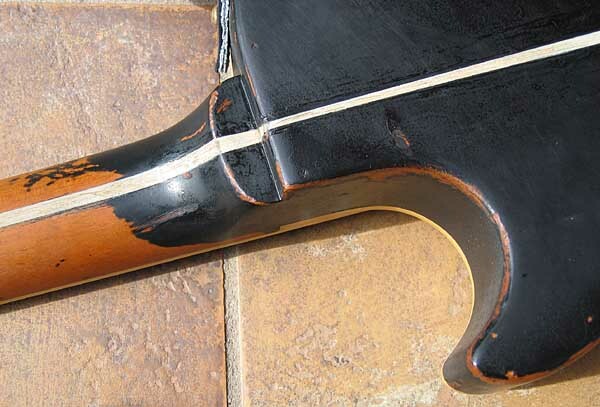 Typical from Gibson's Custom Shop. 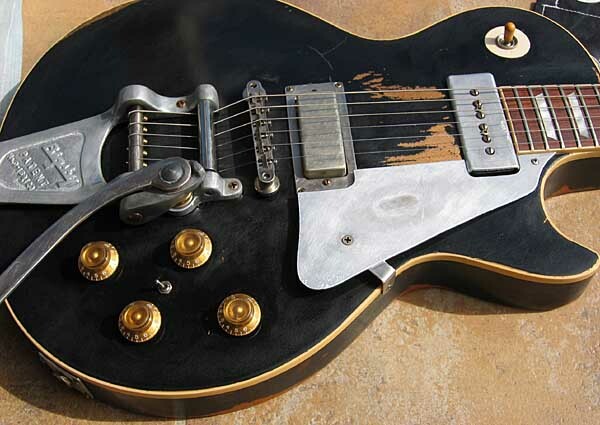 With such a strap holder it's very unlikely this guitar can drop. as once it's made it is no longer adjustable. The aluminum "third cover" hides nothing really. Lore states that it's the same in the original. 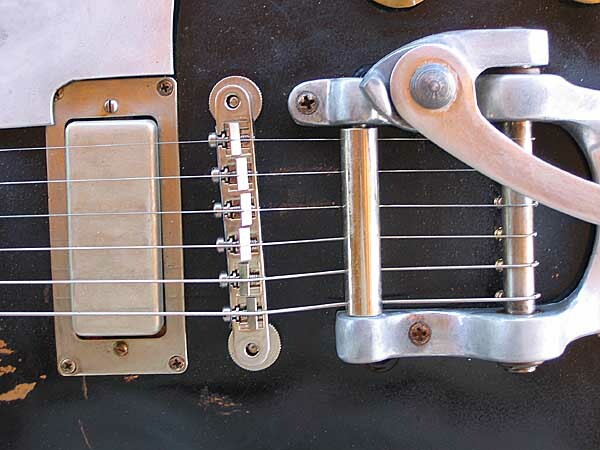 Details of the Bigsby and ABR-1 bridge. 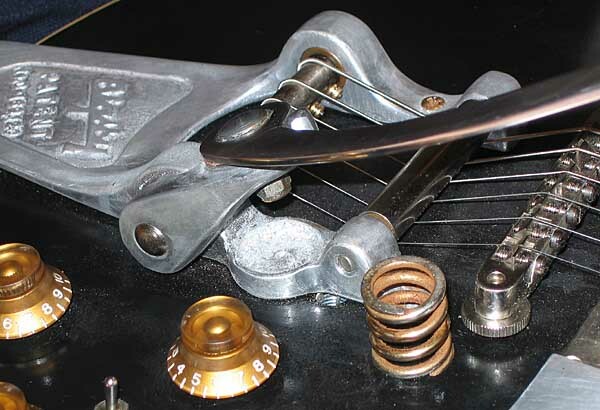 When a Bigsby B7 is used in an ABR-1 equipped guitar, usually the bridge's post wheels are special. 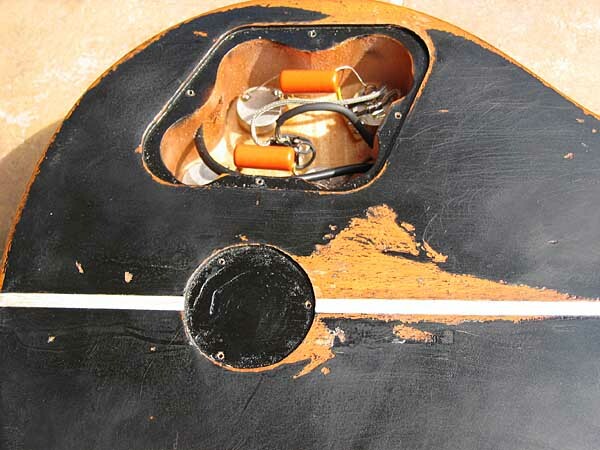 The upper side of the wheels are curved convex to let the bridge swivel with the bar action. This is not the case in this reproduction 'though they are indeed curved in the original Old Black. The whole bridge-posts assembly tend to flex when the bar is actuated. 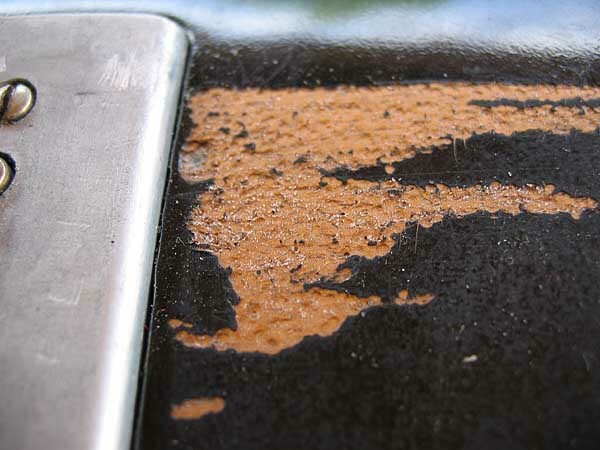 The original stopbar post nut is hidden with black paint. Look at the pics of the original! All Bigsbies have a nylon washer under the spring. It has been removed. 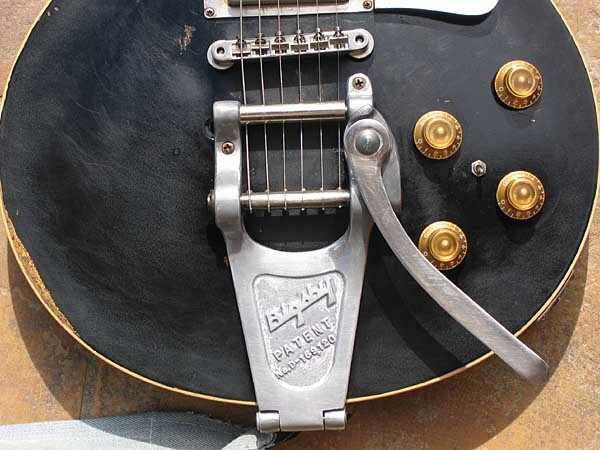 Pay attention to the ground wire running through the old tailpiece stud hole, going under the Bigsby. 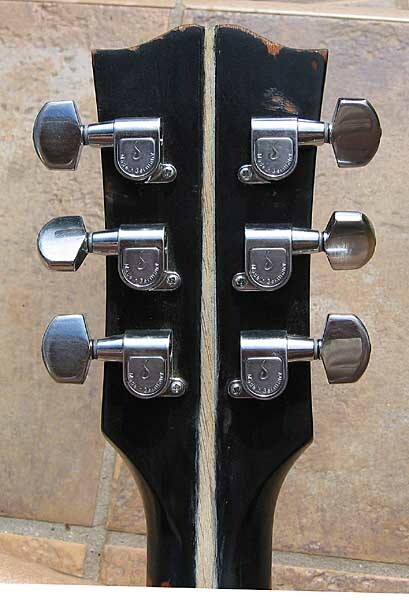 The headstock has been repainted so the serial number is no longer visible. Les Pauls from the '50s had the serial number silkscreened, not stamped as the current ones and so are the Historic Reissues like this R6. 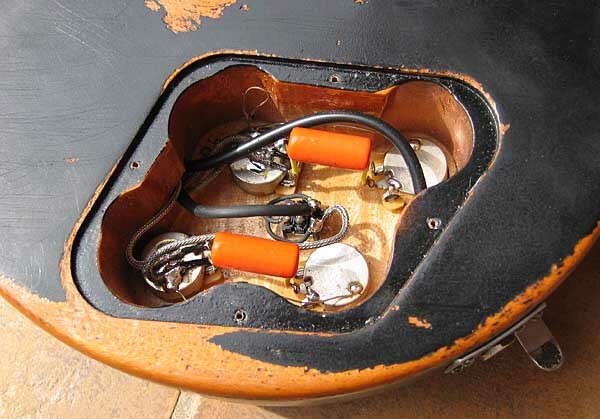 Thus, you cannot see the serial nº as you cannot see it in Neil's orginal Old Black... just a stamped "R6" in the pots cavity as a proof of her origins. long gone binding. Again, just like the original. 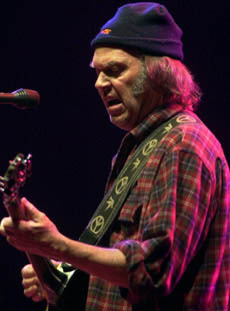 that runs all along the guitar's back. Details of the logos, roughly painted over in black just like Neil's. 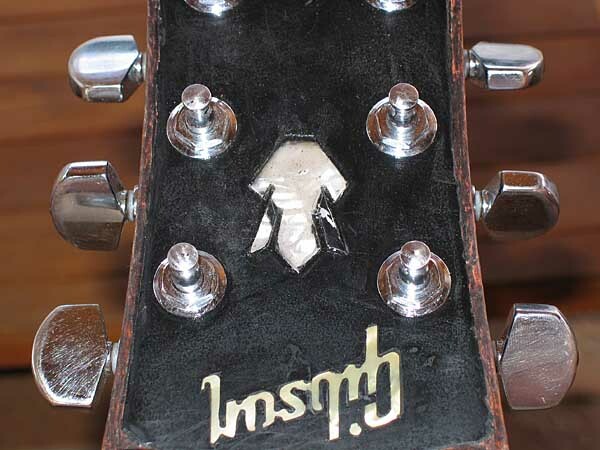 See the aging of the tuning keys, logos and the greenish "Gibson". 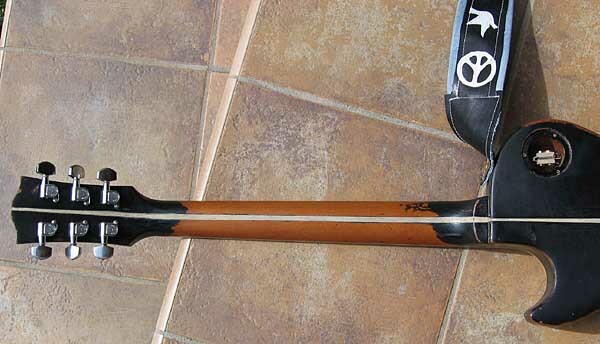 The neck is fat, '50s type though not so "baseballbatish" as in other samples. 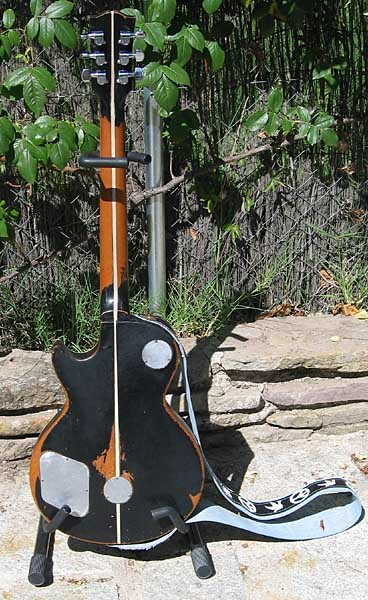 The frets that, regarding the legend, Neil never allowed to change, are also '50's, thinner that current. 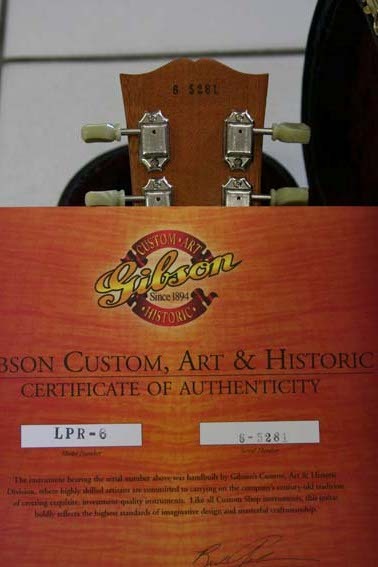 Gibson's Custom Shop made a good job with them. With her "skunk-bar" following the body's stripe. Notice the long Switchcaft switch. The worn heel and body horn. The paint over the wooden stripe makes it an uneven width, like Neil's. 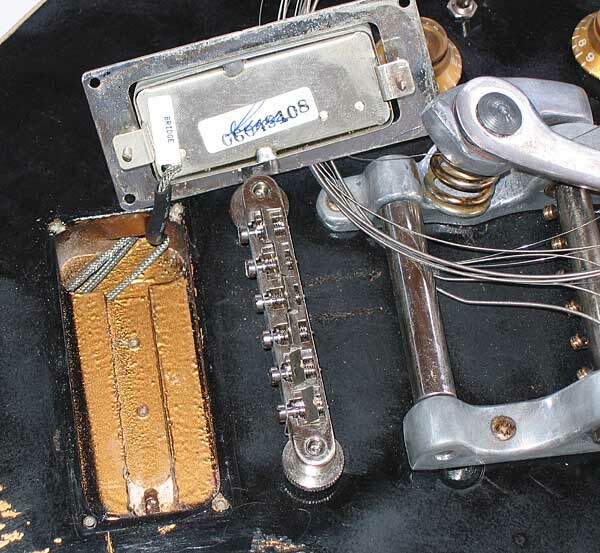 Neck pickup is R6's original but the bridge pickup has been substituted with a Firebird minihumbucker, just like in Neils guitar. This Firebird pickup replica is made by Seymour Duncan. 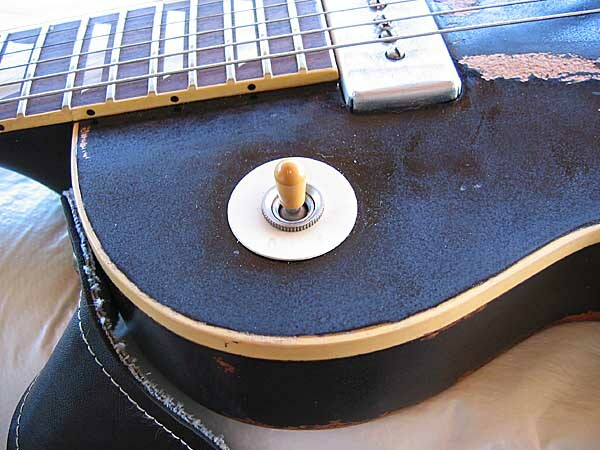 Look closely to the P90's metal cover: looks like it's badly routed or cut in the treble side so you can see a bit of the inner black bobbin. Look closely the first photo of the original Old Black up above and you'll see that it's just as it must be. Such is the detail of this replica. 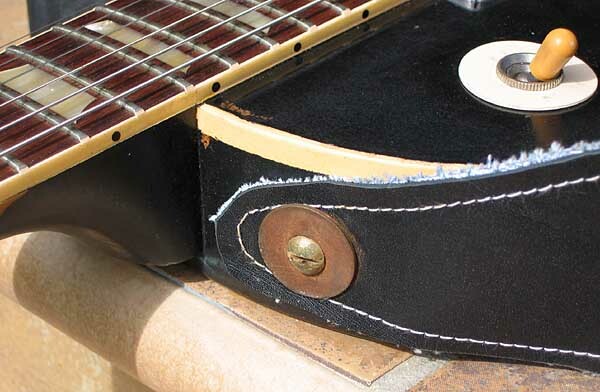 Ditto for the "badly" routed scratchplate. The P90 and it's accurate aluminum cover. Detail of both pieces. You cannot adjust the height in this pickup. Firebird bridge pup is VERY microphonic. Hand signed by somesuch "Seymour" . Neil says that you can actually talk in front of it and hear your voice through the amp. This bridge pickup, a minihumbucker without adjustable polepieces, is so microphonic that it's very difficult to handle in a high gain scenario. 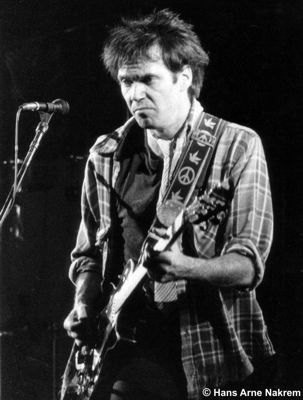 Larry Cragg said that Neil has a special skill, acquired after many years, to make good use of the enormous feedback this pickup can give and has by no means allowed him to wax-pot it or doing any other squeal-taming thing. With this pup, the feedback is quite difficult to handle but you bet Neil's tone is in there! 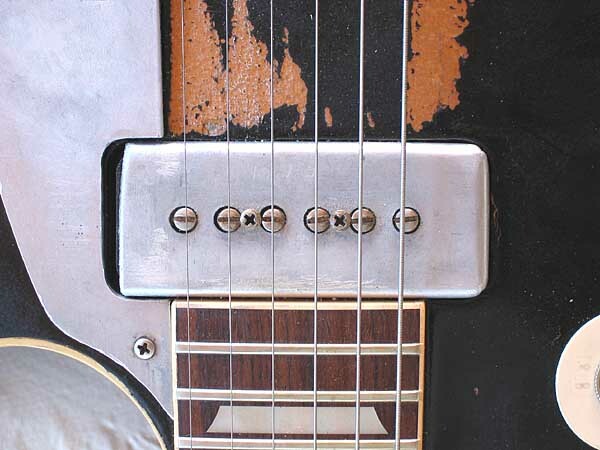 The original pickup ring has also been subbed with a hand made aluminum one and, contrary to the neck pup, it can be height adjusted. All pots are R6's 500K with contemporary wiring. 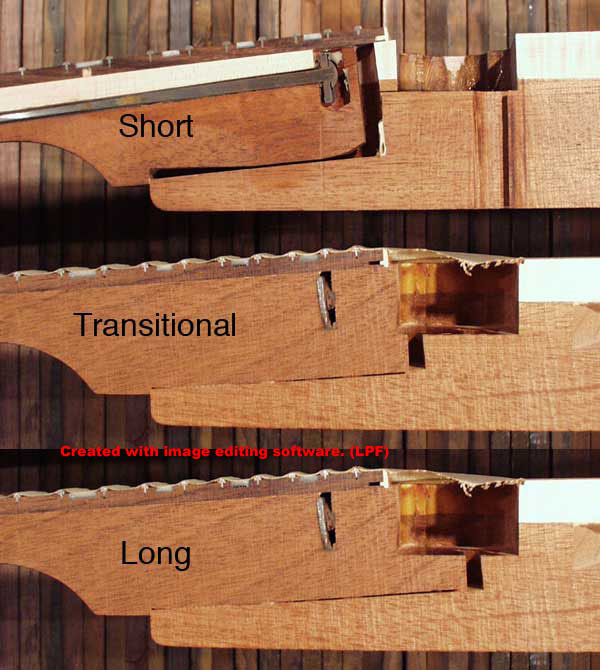 This little switch toggles the phase of the bridge pup. If you switch the lever pointing towards the pups it's in phase. Otherwise it's out of phase. This, of course, only matters when both pups are selected with the main switch. 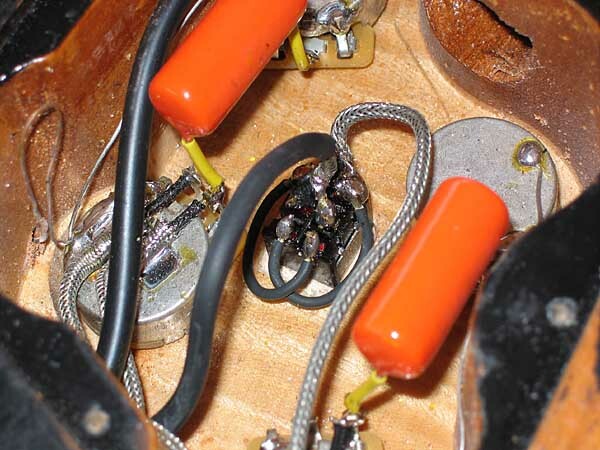 Just beware that if the bridge pup is selected and the mini switch is in the "out of phase" position, you get more "hiss" as the live end of the coil goes electrically connected to the pup's aluminum cover. Put your finger on the cover and you'll hear lots of hiss!. Pay attention to the top's maple grain: flamed! 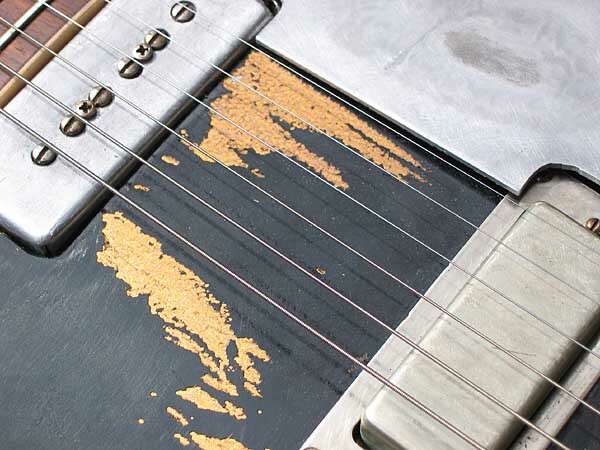 Quite unusual in a goldtop. 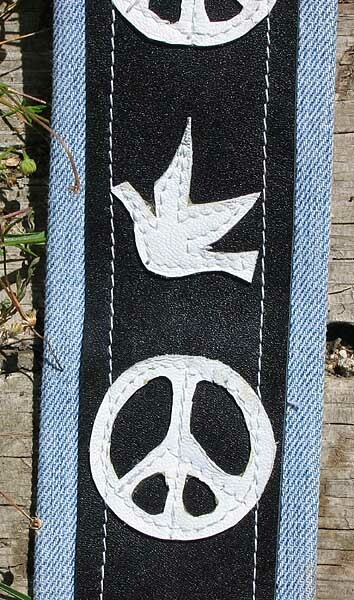 The strap is also an accurate reproduction of the original in denim fabric and black leather front with white leather "peace" and "peace dove" symbols. 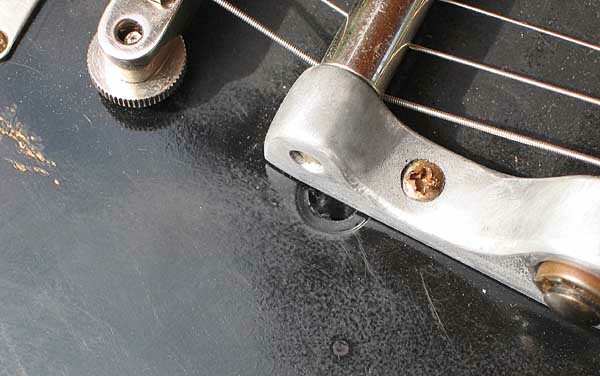 It's attached to the guitar with quite large screws and big washers, not easy to get loose. 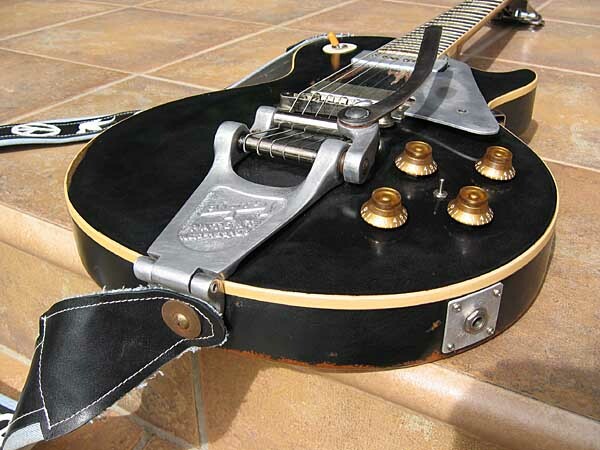 Couriously, the strap is attached upside down just like Neil use to do nowadays. Long ago he used to wear it "the right way". 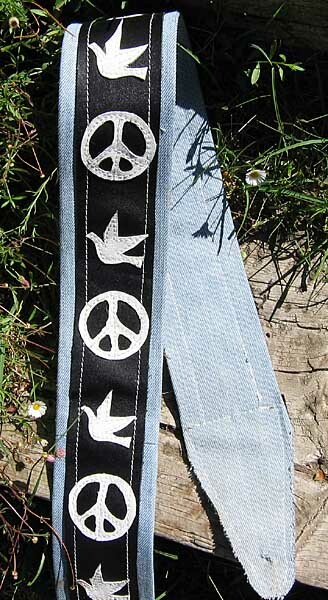 Perhaps an ironic pun from Neil... with today's world peace status it's normal to see the peace dove flying upside down. 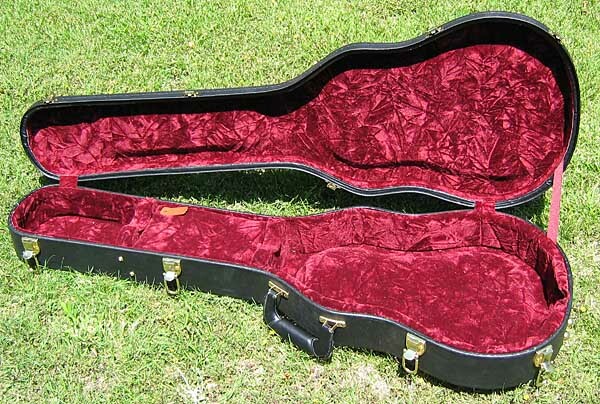 Anyway, the strap put this way looks right when the guitar is in a guitar stand. Look at the very first photo in this page. 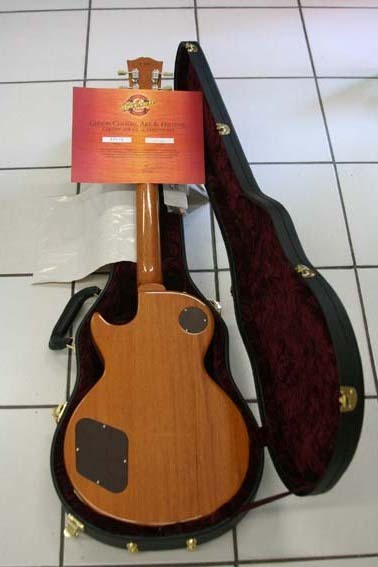 The OHSC is the usual R6 Gibson Custom Shop case but painted much like Neil's with sprayed captions showing the owner's name, groups and fragility status. Inside the case you'll find what's typical in these CS cases. 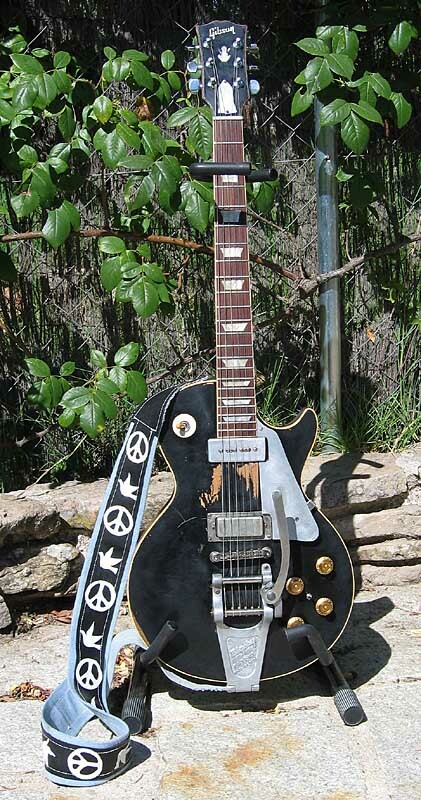 This guitar sounds 100% like Neil's for what it's worth. 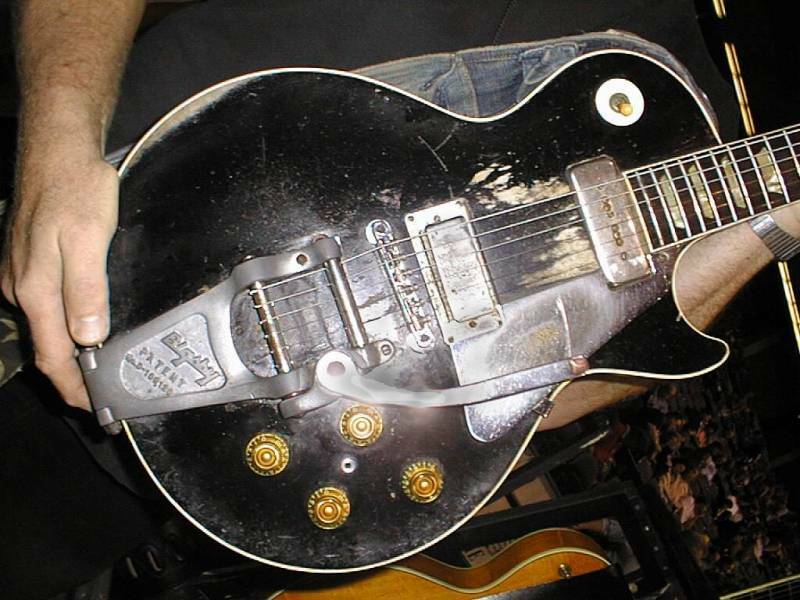 She doesn't sound at all like a normal Les Paul... and there's no such need for that. As she started from "good timber" you instantly feel you're holding a good guitar. The unplugged sound is very good, powerfull and rich. 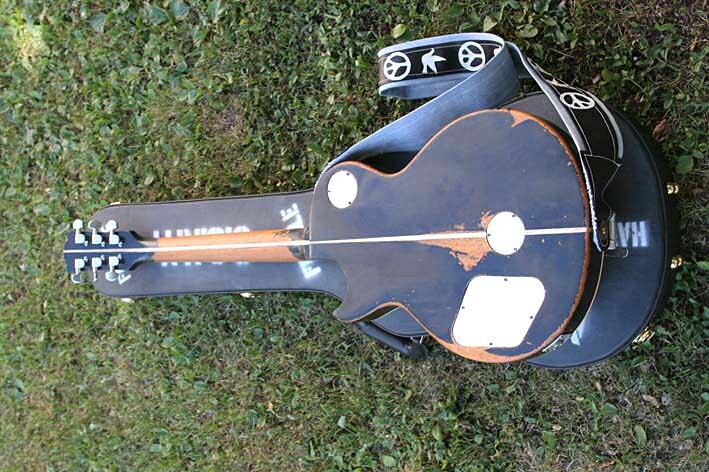 She makes your belly vibrate when you strum a chord. The woods are good and the guitar is professionally made. The neck pickup sounds like no other P90 I've ever heard before, much darker than usual, powerful and with great personality. 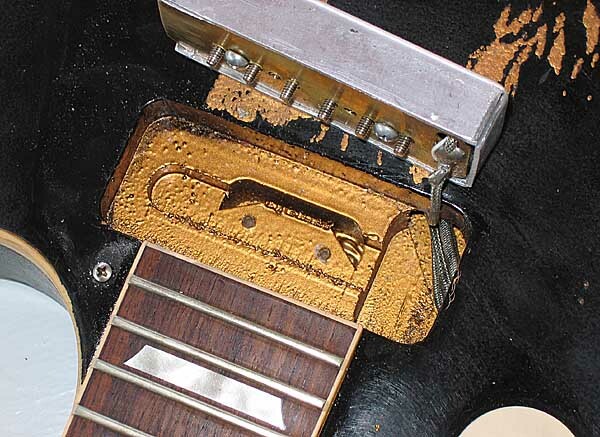 The bridge pickup, as I stated before, is enormously microphonic. It squeals like a pig but there's no doubt that Neil's sound is in there. I don't know what have they done with her but it's amazing how much "Neilish" you can sound with this guitar, this pickup and a good "Tweed" amplifier (Neil use to play this guitar through a late '50s Fender Tweed Deluxe amp). The sound of this pup is strident and "grumpy" and loves tube gain. She's a "raw" and rocking guitar down to the bones and playing her you realize how much Neil's sound relies in the use of the Bigsby. That Neil's permanent bit of "out of tune" sound comes out precisely from this. What's not easy at all is to make good use of it and not sounding uglily out of tune. Not a guitar to play soft pop tunes! 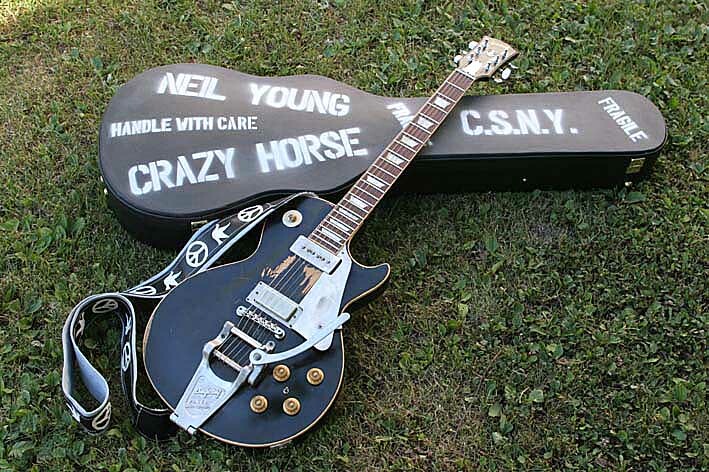 A great guitar and a dream come true for any Neil Young fan.